NEW ORLEANS (WVUE) - The New Orleans Saints lost to the Los Angeles Rams after an overtime field goal. The final score was 26-23. The Saints' fate was sealed with a Greg Zuerliein 57-yard kick that could have traveled 60 yards if needed. The New Orleans Saints took a 13-0 lead in the first have of the NFC Championship after a five yard pass to tight end Garrett Griffin. It was Griffin’s first catch and score of the season. The touchdown came after a pick play in which two Los Angeles Rams defenders crashed into each other, falling to the ground. Griffin was wide open. The only touchdown of the game came after an aggressive attempt to go for the first down after the Saints were stopped. Drew Brees took full advantage of an encroachment call on that play. Saints kicker Will Lutz kicked two field goals in the first quarter – from 37 and 29 yards. One of them came after a Jared Goff interception, which linebacker Demario Davis picked off. A fake punt in the second quarter gave the Rams their first first down and eventually led to a field goal. The high octane offense has been kept in check, so far. Six points was the fewest the Rams put up in a half since Sean McVay took over as head coach. Former Saints wide receiver Brandin Cooks helped fuel a drive at the end of the second quarter that ended with a Todd Gurley touchdown, bringing the score to 10-13. McVay’s low scoring half streak remains intact. The touchdown helped make up for a dropped pass by Gurley earlier in the game that would have put the Rams inside the New Orleans 20. 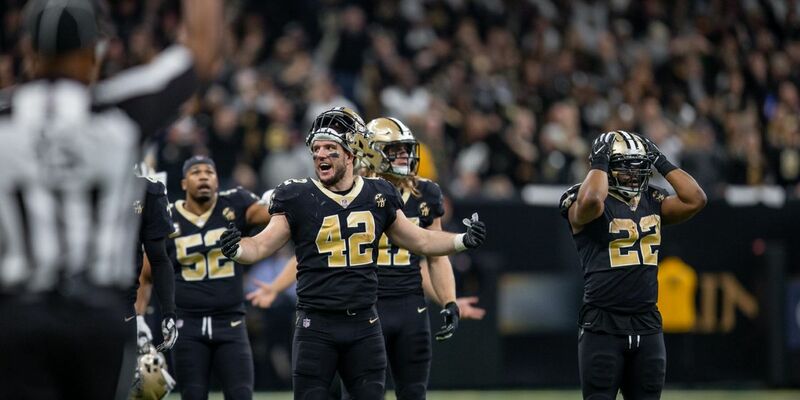 The Saints scored first in the second half after folk legend quarterback Taysom Hill scored a touchdown on a two-yard catch. It’s his first receiving touchdown of the season. Alvin Kamara caught four passes on the 71-yard drive. The score stretched the lead to 10 points for the Saints. Los Angeles cut the lead to three points after a pass from Jared Goff to Tyler Higbee in the third quarter. The 10-play, 75-yard drive included a 25-yard reception by Brandin Cooks. The Rams tailed the Saints 20-17 at the end of the quarter. Los Angeles rallied in the fourth quarter and kicked a field goal to tie the game with five minutes left to go. The Saints would drive back to the Rams' red zone before the drive was stopped by a missed pass, and possibly the most controversial moment of the game. Tommylee Lewis was hit by a Rams defensive back before a Brees pass got to his hands. The team settled for a field goal. In overtime, the Saints won the coin toss, but Brees threw an interception to John Johnson III as he was falling on his back. The Rams turned that into three points with a field goal. The loudest Superdome in recent history fell silent. The Rams are the first NFC road team to win game in six years. The team never led until the winning kick.